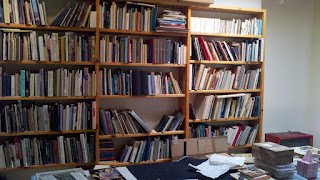 As mentioned in a previous missive we are moving much of our gallery’s library to our house in Santa Fe. And, as is bound to happen, there came a day at the beginning of the month that the truck arrived with 180 cartons mostly filled with books! They had been packed up by our art movers in New York, Gander & White, and the cartons were handed over to Art Handlers, Ltd. which specializes in art moving in Santa Fe and they brought them cross country. In order to avoid the tornados near Joplin they took the southern route but had not checked with Mother Nature first. When the truck arrived in Nashville with a blown turbo, which took a day to replace, they could not leave again for another day because of tornado warnings there as well. Happily those tornados did not hit and finally, three days later than anticipated they arrived in Santa Fe. Then with less than a day’s rest they delivered the shipment to our house. On the way in, however, they had to lop off some large branches from our tree at the driveway to allow their truck to pass. The owner of the trucking company, Sharon Pattison, who had accompanied the shipment from New York and her heroic truck driver, Jay Quintana, arrived with four men to lift the cartons out of the truck and set them as near as possible to their eventual resting place. As much as you expect it, it is still a shock when it all arrives! Sharon and Diana Nixon, our New York librarian, were by the truck to direct in which direction the specific cartons should go. 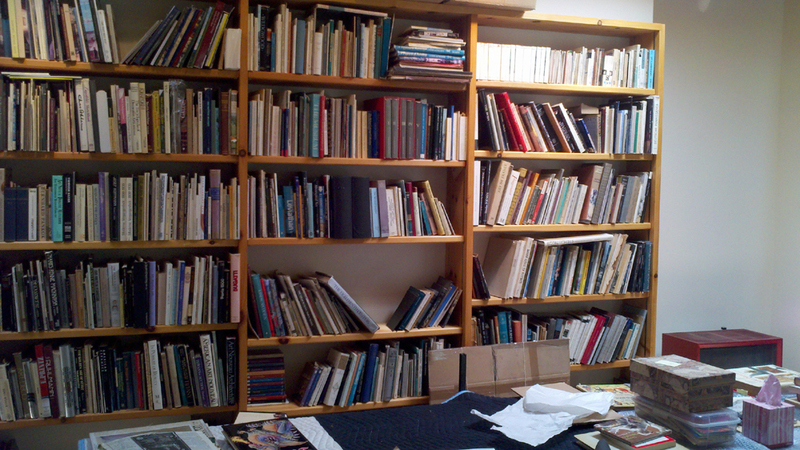 Penelope was in the basement where she had had metal shelving erected and pointed to the area where we planned to shelve the books and I was there to take care as to where the fine arts, which came along would be placed; more on this next week. As of this writing it has been a week since the truck unloaded; the books are in place and there are a very few cartons still to be opened. Not that this is the end of the job, as we still have all the books that have been already housed in Santa Fe that will have to be integrated! Now, the next question that comes to mind is where are what books. There is method to our madness: exhibitions and museums as well as most sculpture and decorative arts volumes are here in Santa Fe; books related to provenance research, such as collections and auction catalogs, are going to our New York warehouse; and old master drawings and paintings as well as a selection of sculpture and decorative arts books being at the gallery. Thank goodness for our library software. We will be looking there first to be sure where the book might be! As I have heard so often, the Frick library is two blocks from the gallery, why not just use that. Unfortunately, not everything is there. In rare cases visitors to the Frick have been guided to our library, also old European auction catalogs might not be available or the volume desired is not always easily accessible. One never knows when a publication must be retrieved.